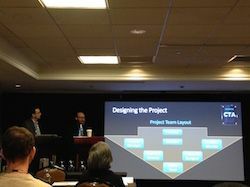 Roy Anthony (right) explains how to organize your team when designing a large-scale projection mapping project. James Robinson (left) adds comments. Back in August 2015, Obscura Digital, working with executive director of the Oceanic Preservation Society, Louie Psihoyos, created an elaborate display that projected images and video of endangered species onto the façade of the Empire State Building using Christie Roadster projectors. SCN wrote all about the project back in October, and since then, this massive deployment has become a prime example of a well-executed projection mapping design. Earlier this week (January 26th and 27th), Christie paid NYC a visit to host a Certified Technology Accelerator series of courses that help integrators explore the latest trends in display technology. The Wednesday afternoon session, titled ‘Projection Mapping: The Art of Pixelscaping Reality,’ took a deep dive into the large-scale projection displays like Obscura Digital’s ‘Projecting Change’ at the Empire State Building. But accomplishing a project of this scale goes way beyond the technology, as presenters James Robinson and Roy Anthony (both part of Christie’s research and innovation department) pointed out—it takes careful planning and work with every piece of your team to make sure the final display hits that ‘wow’ factor that you are looking for. A little history on projection mapping—some of the earliest examples can be found at theme parks, specifically in Disneyland’s Haunted Mansion, where they projected video of singing faces onto statue heads to create the illusion that the statues were ghosts. Compared to today’s technology, this example is fairly antiquated, but it was one of the first—we’ve now had time to develop technology to create a true augmented reality onto virtually any surface. Most recently, the trends in projection mapping have elevated to wrapping the images around a 3D surface, as well as creating fixed installs. “We really want to see solutions with set it and forget it capabilities,” Robinson said. He explained that in many markets, specifically retail and design reviews, 3D projection mapping has become popular, and it requires integrators to design systems that anyone can maintain. “It has to be fool proof,” he said. Projection mapping is so much more than setting up a projector though. In big cities like New York or Los Angeles, project managers have to factor in every minor detail, from hiring the right staff for his or her team, securing all the legal permits with the city, and analyzing the environment and surface where the images will project onto. For example, when designing a projection mapping display, you need to consider where the audience will stand—Anthony said it’s important to make sure moving elements don’t block or disrupt the images, so knowing where to place the images and the surface are important. Lighting is another element you need to look out for—if the images are displayed on a building, make sure there aren’t any extra lights used to illuminate the building regularly that could potentially block or fade your projection. You also need to be sure to carefully calculate nearby objects or other obstructions, especially for outdoor displays. It’s important to understand every characteristic before you start putting your projection together. And finally, be sure all the buildings you use are on board, and make sure the city is aware of when, where, and how you will execute your project. This course, ‘Projection Mapping: The Art of Pixelscaping Reality,’ was one of four courses designed to help integrators, consultants, and other AV industry professionals understand the latest trends and technologies in display technology. It is part of Christie’s series of courses that helps earn credits towards your InfoComm CTS renewal.